It covers almost 350 square miles of the California desert at an elevation that’s only a few feet higher than Death Valley’s famed Badwater. Its water is twice as salty as the Pacific Ocean. You might think it's a mirage when you first see it from a distance, an optical illusion formed by shimmering heat waves rising from the desert floor. And it's disappearing fast. In fact, it should never have been there in the first place. If you want to see the Salton Sea before it’s gone or changed forever, here’s how. The Salton Sea is a fascinating place with an otherworldly look about it. During some parts of the year, it's an excellent place for birdwatching. It is also a popular site for camping, boating, and fishing. However, algae that grow in the lake blooms in early spring and summer. When it dies, the decaying vegetation – to put it plainly – stinks. The putrid smell shouldn't be underestimated, but it only lasts part of the year. Boating: Because of the high salt content, boats float better than they do in fresh water. Engines operate more efficiently at the low elevation. That earned the Salton Sea a reputation as one of the fastest lakes in the U.S. If you bring your boat, you'll find several marinas and plenty of room to run around. However, as sea levels fall, access is becoming harder and you may find marinas closed or you might have to carry your boat across the beach to the water. 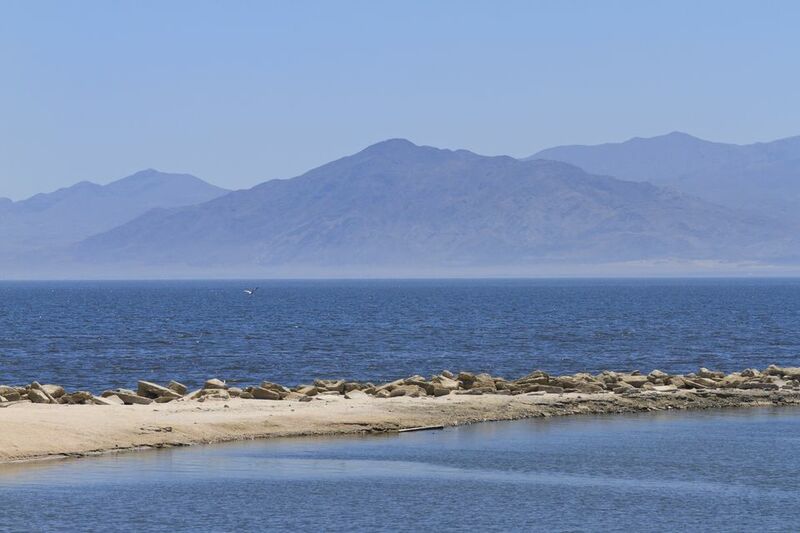 Fishing: Increasing saltiness in the Salton Sea basin has limited the types of fish in the lake. Most of them are Tilapia (for which there are no legal limits). Fishing is best from June through September, and you need a valid fishing license. Bird Watching: The Salton Sea is on the Pacific Flyway, attracting 400 species of migratory birds — almost half of those known in North America. They pass through between October and January. Photography: The extraordinary landscapes, abandoned buildings, and flocks of migrating birds draw photographers year round. Salton Sea State Recreation Area has campgrounds around its shores, but as the sea dries up, they are gradually closing. Check current conditions at the Salton Sea Recreation Area website. Besides the state park, several privately-owned campgrounds and resorts are nearby. They include Fountain of Youth, Bashford's, and Glamis North Hot Springs Resort which also has cabins. The town of Brawley, southeast of the sea has the best selection of hotels and other indoor places to stay. The Salton Sea is one of the world's largest inland seas, once 45 miles long and 25 miles wide. In some places, you can't see the opposite shore because of the earth's curvature. At 227 feet below sea level, it's also one of the lowest spots on the planet. Its story began in 1905, when spring floods escaped irrigation canals, gushing into an ancient lake bed. By the time engineers got the flood under control, the Salton Sea was full of water. Today, that water sits landlocked, and the sea is shrinking fast. Only a trickle of fresh water flows in. Water doesn't flow out naturally. It goes out only by evaporation or when it is sold to local water authorities. As THE SEA dries up, minerals become more concentrated, making it 30 percent saltier than the ocean. Areas that were once under water are exposed to sun and wind, and dust becomes a problem. Letting it dry up is not a practical option. Its managers struggle to figure out what to do about this artificial sea and how to do it. You can find an extensive summary of the issues at USA Today. The Desert Sun newspaper also has a good roundup of plans for the sea, as of 2017. The Salton Sea is 30 miles south of Indio on California Highway 111, about a 3-hour drive from Los Angeles or San Diego. Your route will depend on which side of the sea you're going to. For current conditions, what's open and what's not, visit the Salton Sea State Recreation Area website. Winter offers the coolest weather and a chance to see migrating birds. Summer temperatures regularly soar above 100°F.